When the ice dancing champion, Charlie White, spoke to the press about his gold medal win at the Sochi Olympics with his partner, Meryl Davis, I recoiled slightly at what he said. “…of being there for each other, and that made all the difference.” Oh! Well. That’s all right then. White and Davis really are a great team. It’s always a team effort when something wonderful happens, even if we don’t realize it. You might think you’ve accomplished it on your own, but look around: if you do your Faith Forensics, God’s fingerprints are all over the scene. After delivering her fifth child, author Lindsey O’Connor fell into a coma. When she finally returned to consciousness, she had to be introduced to her toddler, who didn’t know her at all. Her eldest daughter had dropped out of college to help care for her siblings. All this trauma led O’Connor to doubt God, until she realized He had been there all along, helping to keep her family together. “God was even in my questions. I wouldn’t have been arguing with him all this time if he wasn’t there to argue with,” she said. Sometimes we just need to re-focus the lens of our lives so it finds the joy and softens the hard edges. Abide in your faith and God will show up, right on time. Some days you may feel like you’re striking out, and there may be foul balls now and then, but remember: you and God are an unbeatable team. Not in this life, nor I suspect, the next. capping our eaves with sugar icing. people will shock your heart. except that it could be. the light looks at sunset. Not in this life, nor I expect the next. When was the last time that you felt joy? That you laughed out loud? Hummed a happy song? Even if you are generally happy person, there are times that you don’t feel joyful. Maybe you are in pain from a chronic illness or you’ve lost a loved one. Perhaps your job is in jeopardy or you are waiting to hear back from the bank. These are all stressful times when it is hard to feel anything but sorrow and worry. That’s why I was so surprised to read about a woman named Aloise. A polio victim, Aloise was trapped in a wheel-chair when the holocaust swept through Rwanda in 1994 and so many Tutsis were killed. Yet she made it to a refugee camp with her two sons. When author Immaculée Ilibagiza met Aloise, the woman’s laughter could be heard ringing across the camp. Of course, she had her sons so she had reasons to be joyful. But she also had reasons for sorrow. She had no idea if her husband was still alive and in hiding. Furthermore, on her own journey, her infant daughter had died. Yet, she chose joy. Even in the midst of a holocaust, she laughed. She celebrated, and in doing this she lifted up those around her. If you haven’t read Ilibagiza’s Left to Tell, pick it up today. I wasn’t sure I’d enjoy the book, such sorrow!, but it is more than sorrow. It is the story of how one woman found God while hiding from her would-be killers. If is about how she found courage and wonder even in the midst of so much killing. And, truly, if the Tutsi women of Rwanda could find reasons to be joyful in 1994, so can we. Thursday is rapidly becoming my favorite day. Not only is it the day that I typically write my latest post, but it has become, for me at least, that rarest of things — an oasis of calm in my hectic week. The work week starts on Monday with a slew of chores that somehow piled up during the wide-open freedom of the weekend. Tuesday builds to Wednesday, always a busy, constricted day, bounded in part by preparation for — and the actual recording of — my radio show (www.blogtalkradio.com/openbook). When Wednesday night falls, I suddenly see the end of the week hurtling toward me, and I am not ready for it. Into the chaos slides Thursday, always surprising me with its blessing of one more day to get things done before FridaySaturdaySunday falls on me with its own list of commitments and strictures (yes, free time can be a stricture, especially if you feel bound and determined to enjoy it, at any cost, because there is so little of it, and you will have to wait an entire week for more). So here’s to Thursday, a day we need, falling just when we need it. It is one of many things — seemingly small things — that bring hope and happiness to our lives. It is a lie to say this. and it will hold you. the whole of God is in it. This is the size of hope. I’ve been thinking about this verse a lot this past week. 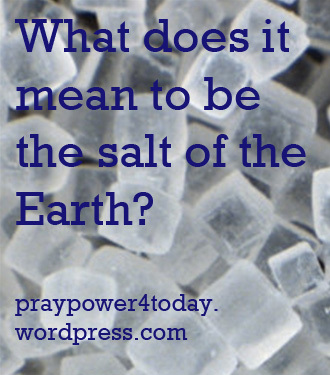 Specifically, what does salt do, and what does it mean to be salt of the earth? We use salt in cooking to bring out the flavor in foods. If there is too little salt, these same foods taste flat. You can always add more salt if you don’t add enough the first time, but if you add too much, it is irreversible. The salt overwhelms the other flavors. What then does it mean when we are told to be the salt of the earth? Over and over again, Christ tells us to serve each other. We are to help the poor, the widows and orphans. By doing so, we enhance what is good in this world. But, like actual salt, we also need to be careful not to overwhelm. We overwhelm when we decide, in our infinite wisdom, what is best for someone without taking stock of the individual situation. Sometimes we overwhelm people by not taking their norms of their culture into consideration such as if we give them food they cannot eat or, because of the destruction caused by a natural disaster, have no way to prepare. Sometimes we overwhelm people when they try to tell us what they want or need, and we decide that we know what is best for them, disempowering them and forcing our will on them. Just as salt is essential in our diets, service is essential to our lives as Christians. Enhance without overwhelming. It’s a tricky balance to achieve but when you do, the resulting dish will be pleasing to the palate and nourishing to the body. Admittedly, I never knew exactly what to think when I got to verses 11 and 12 which say. . .
Did this mean that Christ’s followers could expect poverty? That they should be continually meek? Last Sunday, Pastor Carol challenged us to think of the Beatitudes as a cup of fast food coffee. Look out, this can burn! Why? The Beatitudes aren’t meant simply to comfort the have-nots. They are a challenge for the haves. Christ had a nasty habit of calling us to action. Sure, he also patted his followers on the back and told them things would get better, but often he told us how to make things better and it meant being His Hands on Earth. Think about that and look at the Beatitudes again. “Blessed are those who mourn, for the will be comforted” becomes “Bless those who mourn. Comfort them.” As in, do it, don’t just wait for it to happen in heaven. 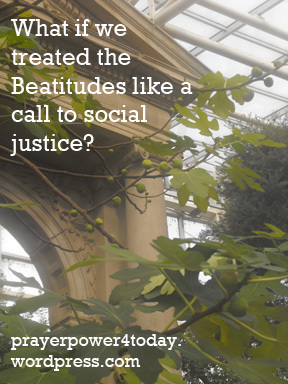 Look at the list of those who are meant to serve and you will see that the Beatitudes are a call for social justice. With that in mind, the last two verses make sense. Why? Those who have a lot to lose may not be happy when we work for those who have nothing to lose. 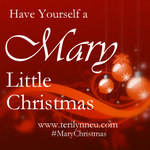 1Now when Jesus saw the crowds, he went up on a mountainside and sat down. His disciples came to him, 2 and he began to teach them. Some people are naturally happy. They bound out of bed, a tune on their lips, ready to embrace the day. And then there’s me. I pry myself out of bed with the greatest reluctance, as sleeping is perhaps the one thing I do exceedingly well. (And if the cats didn’t need feeding and tending to, I’d probably skip this step altogether some days.) The truth is, happiness doesn’t come easily to everybody. And that’s okay. See, I’ve learned that happiness is like a garden (or a marriage, or any number of other metaphors). Even if you have great soil, the best seeds and plenty of sun, you still have to tend to it. Happiness requires work. Like all things worth having, it ought to. I’ve started a new practice. Last week, during my hour of Perpetual Adoration (which, simply put, consists of sitting with God in silence for an hour), I picked up a book, the biography of some saint or other. (I wish I could remember her name, but I can’t.) Anyway, the back of the book stated something that blew my mind. This saint realized that there was only thing that she needed to do in her life, and that was to love God. Just that. It sounded so simple to me that the logical, Spock-like section of my brain immediately questioned it: But what about actions? Don’t I also need to praise God and thank God and, and, and? It’s funny what happens when you say, “I love you.” Your heart slows down. You smile. There’s no way to be grumpy when love is on your mind. It’s a lovely reminder of all that is good. Sure, it’s not much of a practice yet. I know I can do so much more. But it starts with this, just saying, “I love you.” Everything that ought to flow from that will come. I’ve got good reason to believe it will. Each month, a van full of Jehovah’s Witnesses fans out on my block, knocking on doors and spreading their gospel. I must be on their “non-compliant” list, because every one of them that shows up on my doorstep looks terrified. I had to stop him from going full-bore into his spiel; it was the humane thing to do. In the past, I’m sure I must have been prickly to them. This time, I was purposely pleasant. As I closed the door, I thought, if you really wanted to portray your religion in a good light, you’d put aside what you consider the Soul Service and come to people with Social Service. On my block, half of the people are behind on the mortgage, many are unemployed, and some are retired and on a fixed income. Come to my door and say, I see you’ve got a wobbly railing here on your front steps. I’d like to fix it for you. No charge. It’s part of the outreach of my church. If you fix the railing, you can bet that when you’re done, I’m going to ASK YOU about your faith. I want to know more about any religion that offers this kind of human-need help. I had what Oprah calls an “Aha Moment” as well – I’ve long said that I’m one of those SBNR people – you know, Spiritual but not Religious. But thanks to these door-to-door soul-salesmen, I realized that I do have a religion. And it can be summed up very simply. The condensed version of this would be: Always Do the Right Thing. So I suppose I would have to admit that these religious people who showed up uninvited did give me a spiritual epiphany of sorts. Even if they didn’t convert me or save my mortal soul, they gave me food for thought and some insight into my own philosophy. And for that, I really am grateful. By the time the meeting ended, I was frustrated and more than a little angry. We had gathered together to study the word of God. Ironically, our topic was the point at which the Israelites forgot how bad it had been in Egypt and started complaining to Moses about how bad they had it now. Thirst vs enslavement and degradation. It isn’t like everyone joined in, but those of us who didn’t join in remained silent. I can’t speak for anyone else, but I just wasn’t sure how to turn things around gently. Because I was worried about offending them, I kept my mouth shut. By the time the meeting ended, I was completely bummed out and not even sure I’d be back. 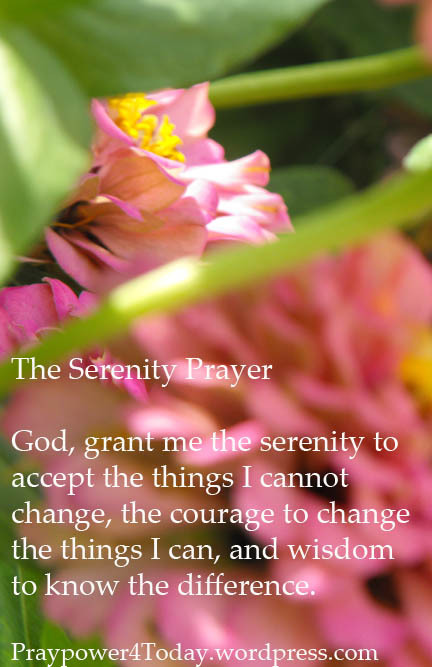 Then I saw the serenity prayer. I think this situation weighed so heavily on me because I knew that someone should have done something. And, really, except for my worry about offending someone, there’s no reason that someone couldn’t be me. There really is no reason to let someone turn an opportunity for learning into a gripe-fest. Yes, it will take time and it will take prayer, but God will give me the words I need. I just need to ask and to listen for his answer.